This article gives a short overview about several concepts related to ‘power’ from 20th century French social theorist Michel Foucault. He was highly influenced by Jean Hyppolite and Louis Althusser. Foucault is both associated as a structuralist and became later on a post-structuralist, but rather rejects this labels because he prefers to present his thoughts as a critical history of modernity. Unfortunately he died by HIV on a very young age of 57 in 1984. Structuralism is the methodology with human elements such as culture, and must be understood as a relationship to a larger, overarching structure. structuralism is the belief that the phenomena of human life is not intelligible except through their interrelations. Everything is organized in systems today, for example language is a system with binaries. People can be understood as products of that structure or system. The invention of a certain structure is creating the democratic subject. “For Foucault, analysis that remained too structural in nature “can never take place but in the synchronic cross section cut out from this continuity of history subject to man’s sovereignty” (Foucault, 1996a. 59). Post-structuralism is a late 20th century movement and forms a opposition to structuralism. The textual analysis is different; the reader must replace the author as the primary subject of inquiry and, without a central fixation on the author, post-structralists examine other sources for meaning like readers, cultural norms, other literature, which are therefore never authoritative, and do not promise no consistency. It has the aim to achieve a equal part in the interpretation of a piece to the cultural and social circumstances of the author. An author’s intended meaning (although the author’s own identity as a stable “self” with a single, discernible “intent” is also a fictional construct) is secondary to the meaning that the reader perceives, and a literary text (or, indeed, any situation where a subject perceives a sign) has no single purpose, meaning or existence (Philosophy basics, 2008). “A subject is one possible “form of existence” versus multiple personalities” (Foucault). In the first instance, people were subjects of sovereign power, but society changed and created other forms through the production of compliant subjects through the imposition of disciplines (Prado, 53). Instead of using violence to force humanity, it was seen to make individuals want to conform, even need to conform. This new conception has to different aspects: firstly an individual is a subject in the sense of being subject to regulation by other individuals, institutions and the state. And secondly an individual is a subject in the sense of experiencing any form of subjectivity, by being ware of it. Subjectivity includes having aims, desires, and – most important today – a self-image or a sense of who and what one is (Prado, 56-57). Foucault his theory on subjectivation forms a theory of self-reinvention. Together with his theory on power that impose discipline on a body and a control over the psyche forms a part of the implementation of the individuation of the subjugated subject. With this, Foucault insists new creations of relationships between individuals in new modes of life; the politics of friendship (Faubion, 86). 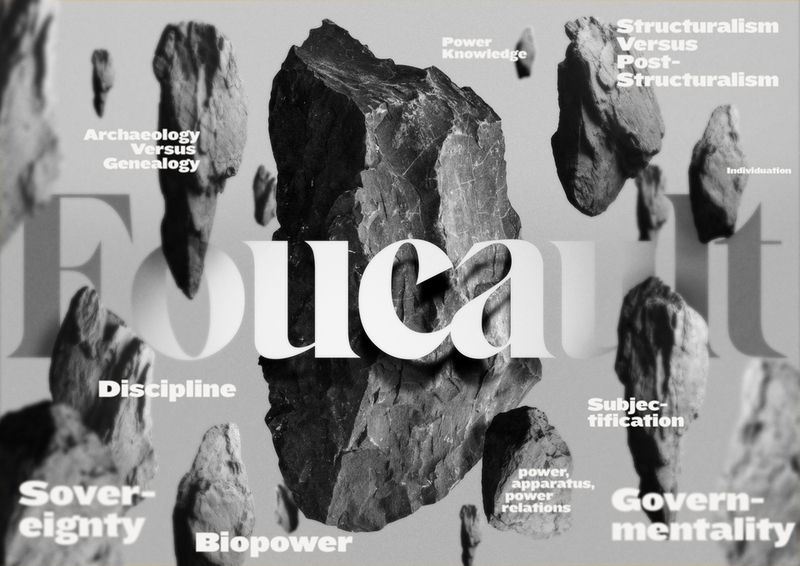 Archaeology is a method used by Foucault in his earlier works like the Order of Things. “Archaeology … means digging into background reasons why a certain object, statement, discourse … is able to be born and be picked up and sustain itself in cultural situation” (Parikka 6). It is the study of artifacts that occurred at the same time, and the search for why they exist in culture. It looks at why certain things fit together, that is, it looks at finding connections between things at a certain time. This method is synchronic, that is, it explain a period in history. Genealogy is a method that appeared in his later works, like Discipline and Punish. It allows the researcher to analyze and trace the power relations or forces from which historical moments emerge in their disjuncture. It operates on the same level of culture and knowledge, and is concerned with problems that are below the surface. It is diachronic, that is, it explains the continuity of history. It also shows circumstances that gave birth to things we value. Genealogy is material, multiple, corporeal and casual. Genealogy is perhaps best explained through the example that a genealogical understanding of a machine looks beyond its internal specifics. It takes a machine as “vectors across the geopolitics of labor, resources, planetary excavations, energy production, natural processes from photosynthesis to mineralization, chemicals, and the aftereffects of electronic waste” (Parikka 139) Another example would be: what kind of people would fit in a certain set of artifacts. According to Foucault, we have to stop thinking about power from a juridical conception. Around the late 17th century, public torture and executions were increasingly replaced by enclosed punishments, taking place behind the walls of official buildings. The emergence of the penitiary marked a crucial shift from law enforcement to surveillance according to Foucault. Discussing discipline, Foucault argues that there was a changed nature of judgement, focussing on souls instead of someone’s actions. Modern punishment normalizes behaviour and uses disciplinary techniques to produce obedient or submissive bodies. In the Panopticon example, Foucault proclaims that surveillance can turn submission into conformity with norms. Monea, A., & Packer, J. (2016). Media Genealogy and the Politics of Archaeology — Introduction. International Journal of Communication, 10, pp 3141–3159.